Play School has been a favourite for preschoolers Australia-wide for decades and is certainly well-loved by the ‘junior’ Babyologists on our team. I think it would be fair to say that with under four-year-olds, Play School presenters have celebrity status! 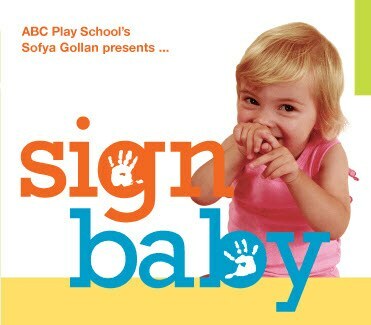 Our Managing Editor, Mandi, was fortunate to have an opportunity to interview Play School presenter Sofya Gollan about the release of her new Auslan (Australian Sign Language) DVD, SignBaby. In this interview, below, Sofya tells us about the inspiration behind SignBaby and gives us insight into how she juggles life as a busy mum and star to the sippy-cup crowd! Do you have children, how many and how old? I have a boy who is now four – he will be starting kindergarten next year. I encouraged him to do signs with me before he could speak and I do believe it helped a lot with creating the confident and talkative little boy he is. Even now he remains very interested in signing and we still do it from time to time. Tell us a bit about the new SignBaby DVD? SignBaby springs from my own experience in signing to my baby and from the first-hand knowledge of how hectic life as a parent really is. I wanted to make sure the SignBaby DVD would be easy to use straight away, be fun for you and your baby, and offer a wide range of signs to reflect varied interests. The DVD has over 200 signs to cover all kinds of situations at home or out and about with your baby. They are presented as bite-sized tutorials, with approximately 15-18 signs in each, giving you the flexibility to stop and start wherever you choose. We’ve also included signed versions of popular nursery rhymes as most of the children I know love to combine signing with music. One of the more important elements of the DVD is our extensive interviews with parents and professional child carers who have taught their children to sign. There’s also interviews with professionals who use signing in their clinical practice, such as speech therapist Sarah Starr. We decided to make SignBaby because there was nothing else like it available that was of high quality, had a large vocabulary of signs and answered questions that parents often have – all in the one package. The other thing that spurred me into action in creating the DVD was that while there’s lots of British and American DVDs and signing books available, their signs are very different to Australian signs. I was starting to see many babies who could sign, but with a very strong British or American accent on their hands! We’ve also created a website that parents can visit to gain tips or find out more about how they can use signing with their children – www.signbaby.com.au. How did you get started as a Play School presenter? I’ve been working with Play School for nearly thirteen years. When I graduated from NIDA I was approached by the then executive producer who was keen to see signing done on the show, and they liked me so much they kept asking me to come back. I still do anywhere from four to eight new episodes a year (if you want to see more of me then write to the ABC!). I really enjoy working on Play School; the other presenters are lovely and fun to work with, and of course it’s always nice to work with the real star of the show, Big Ted. It’s quite unusual to see hearing-impaired actors on television. How have your experiences been working in the entertainment industry? What have been your biggest challenges relating to this? I’ve had a pretty good run as an actor as I was usually able to work for quite long stretches. But I do have to admit that many of the roles I was being offered were deaf characters who were victims. One such character was a girl who had been chained up in her father’s backyard for her whole life because he was ashamed of having a disabled child. I found I was getting very impatient with these kinds of stories as they were so far removed from the realities of people with disabilities. It seemed impossible to get writers to accept that many people with a disability actually have interesting and rewarding lives, raise children, and try to pursue their dreams as best they can. At that point I diverged into making films as a writer and director and found my calling as I could control the kind of material I was creating. SignBaby is one of many projects I enjoy creating and working on. Indirectly I’m sure I challenge the general perception that deaf people can be in control of their own lives but it is a very common occurrence I’m happy to say! Discrimination still exists of course, but I’m happy to keep working to change that by doing what I love to do – write and direct. What are the biggest challenges you find being a working mother and juggling everything on a day-to-day basis? Finding enough hours in the day! Both myself and my partner are freelancers so we have to be careful that we don’t let work pervade everything and that we don’t think about it when we’re just hanging out with our son. I acknowledge that I’m glad to be able to have three days a week that are non-negotiable work days, when my son is at daycare. I don’t feel guilty that I need (if I’m honest, dream about) that time, because I try to make my time with Vinnie as much about him as possible. What keeps you busy now? What’s next? I am pulling together the finance for a feature film, MELT, to shoot in early 2010. Isabel (producer of SignBaby) and I are working on I Can Sign, a show we hope to take to the ABC, that would teach children how to sign a short and fun song in sign language in five minutes. Many thanks to Sofya for telling us about SignBaby. The SignBaby DVD is $29.95 and is available directly from SignBaby. Check out this quick excerpt from the DVD.